The Star Wars galaxy is full of fan-favorite characters like Luke Skywalker, Han Solo, Princess Leia, and Darth Vader, but the main players of the films aren't the only ones who attract large followings. In the franchise, there are plenty of instances of a minor character catching on the audiences and becoming an icon in his or her own right. With Star Wars: The Force Awakens now playing in theaters everywhere, it's no surprise that the latest installment in the saga has added to this legacy. 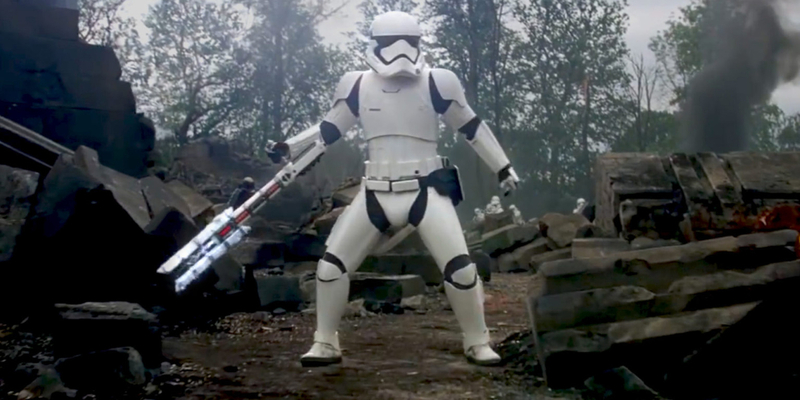 In the film's second act, Finn (John Boyega) is approached by a lone stormtrooper during the First Order's attack on Takodana. The stormtrooper calls Finn a "traitor" and the two engage in a sword fight. Finn, of course, is using Luke Skywalker's original lightsaber, while his opponent wields an electric melee weapon that apparently was part of First Order training practices. Since The Force Awakens came out, the stormtrooper has become a viral sensation, spawning several Internet memes regarding his now famous scene. Fans have even started to call him TR-8R (a cute play on his line of dialogue), and now Lucasfilm is joining in on the fun. Noticing just how popular the character has become, they've fleshed the stormtrooper out with a backstory using the new Star Wars canon material. According to StarWars.com, the trooper who takes on Finn is officially called FN-2199, but his friends gave him the nickname "Nines." He appears in Greg Rucka's young reader novel Before the Awakening, where he is shown training alongside Finn (who then was just FN-2187). His weapon is a Z6 baton, which is issued to soldier part of riot control. Nines was in an elite squad that can either "enforces order or squashes uprisings." Theoretically, it's supposed to be non-lethal, but it can cause serious harm (to the point of killing someone) when used with enough force. For his appearance in The Force Awakens, Nines was played by veteran stunt performer Liang Yang, who has worked on high-profile films such as Skyfall, World War Z, and Edge of Tomorrow. The character's voice was provided by David Acord, a sound editor at Skywalker Sound. Acord has worked on a number of projects set in the galaxy far, far away, including Attack of the Clones, Revenge of the Sith, and the Clone Wars and Rebels animated series. While fans have quickly become enamored with the stormtrooper, they have sadly seen the last of Nines on the big screen; FN-2199 met his ultimate demise during the battle of Takodana. His contributions to the saga may have been all too brief, but at least Nines made the most of his 15 minutes and will go down in Star Wars lore. He's so memorable that he's even been immortalized by Sideshow Collectibles, which is a claim that only a few Star Wars characters can boast. Given what transpires in the film, that may become a more desired item than the Captain Phasma figure - a turn of events few would have predicted.